Makalei Cave, North Kona, Hawaii, 1924. This is a cave to the south of the hill of Akahipuu, and it was there that a man named Ko’amokumoku-o-hueia [Ko’amokumokuoheeia] lived, who came from Koolau and settled here, living as a newcomer. And he lived here with his family: his wife, whose name was Kahaluu; and their two daughters; and one young son named Makalei. And it was for this boy that this cave is called the cave of Makalei until this day. While this man was living here, he began to farm taro, sweet potato, banana, sugar cane, and awa; and it all appeared to be well watered. The natives of the area came to him and said, “The problem with this land is the water; it is a land without water, and you have to get water from the cave, but the places to store water here are kapu and cannot be fetched from in secret; if you are caught, you will be killed by the one who the water belongs. Ko’amokumoku-o-heeia heard this talk of the locals, and this caused him to contemplate about where he and his family could get their water; and therefore, he made a reservoir [pa-o wai ?] for himself, and when the rains returned, water would fill receptacles [haona] then be held in the reservoir. While living there with the family, one day, the boy went to relieve himself at a ravine behind their house, and while he was throwing the old waste into a plain old hole, right then wind blew out from that hole, and Makalei examined it and saw this deep, dark hole. “Where?” the father asked. “Down there,” and the father went to see. When Ko’amokumoku-o-heeia reached the area and cleared away the stones covering the hole, he saw that it was a deep cave and wind rose from it as if it came from the mountains. The mouth to the cave was finished off nicely and there they defecated; while one side of the opening was made so that a person could enter. No kamaaina knew of this cave, and he did not tell his wife, and nor did he talk of it again to his son; he totally refused to speak of the things pertaining to this cave. One day, he entered the cave and saw the great vastness, and that he could walk upright without his head touching the wall above, and there was a lot of water dripping down; he decided to make containers [waa] of ohia, and containers of wiliwili. In the night he fetched wiliwili and carried it on his back inside the cave, and it was inside of the cave that he dug until he made the opening of the wiliwili water container; the ohia chosen was dug out by the farmer and he carried it on his back into the cave. The inside of the cave grew criss-crossed with water troughs of wiliwili and ohia; there was just so many of the water containers that continued to be fitted inside. When the dry season of this land returned as always, he did nothing other than farm, and he had ample water and had no problems with it. It was at night that he fetched water and filled containers and gourds [olo], until the reservoir was full, and this was their drinking water for the month, and so forth. The locals were suspicious about where these people go their water from, being that they did not see the source of their water, and they spoke often about the water of these malihini. This cave still remains, and the entrance is very small but made like the entrance to a house, but within is very spacious and the walls are very tall. When Maguire lived at Huehue, a great water catchment was built inside of the cave and a pipe was laid from the catchment until his house because he wanted cold water like ice water; also, pipes were laid above the catchment so that more water would go into it. The story of this boy, Makalei is a beautiful one, along with his father, and it is a very long story; and should the writer have time to write this touching entertainment, then Makalei will be seen, the one whose name this cave is named after, Makalei Cave. Here we will list the famous storied places [wahi pana kaulana] of these ahupuaa, from the sea until the summit of the mountain of Hualalai. With their names that they were called by the people of old. 13. Hikuhia, in the uplands of Napua. 15. Na hale o Kaua [Nahaleokaua]. 22. Na puu Mahoe [Napuumahoe]. 29. Kapuu o Honuaula [Honuaula Hill]. 30. Ka puu o Hainoa [Hainoa Hill]. 31. The summit of Hualalai and the pit of Milu. The pit of Milu [lua o Milu] spoken of is the pit which Hikuikanahele went to fetch Kawelu under the [Nuu ?] of Milu, the chief of the dark night; this is the round pit atop the summit of Hualalai which still remains to this day; it is a very deep hole and if you drop a rock down the pit, you will not hear the rattling of the rock. The width of the mouth of this pit is perhaps about 6 to 7 feet in my estimation as I am familiar with those regions. The water of Kipahee is a pit which goes down and reaches a spring. It is not rippling water from which to scoop water out of, but it is moss [limu] which you collect until the container is full and then return to the top. Climbing back up is troublesome; should you try to go straight up thinking you will exit immediately, you won’t be able to because you will keep sliding back until you are sitting after exhaustion from sliding down. In order to return to the top with ease, you have to climb zigzag, turning to the right and then to the left, and that is how you climb back to the top easily. 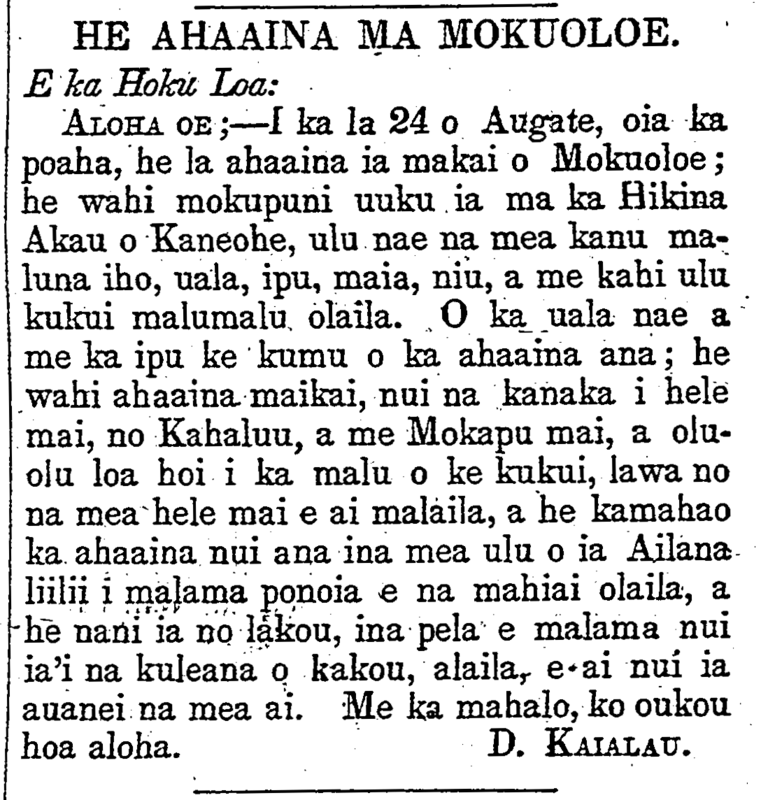 Ka Hoku o Hawaii, Buke XVIII, Helu 1, Aoao 4. Mei 29, 1924. Description of Moku o Lo‘e (Coconut Island) and a lesson on sustainable living. 1859. Aloha oe:—The 24th of August, which was a Thursday, was a day of party at the shore of Mokuoloe; it is a small island to the Northeast of Kaneohe, and yet plants grow upon it: sweet potato, gourd, banana, coconut, and its shady kukui grove. The focus of the feast was the sweet potato and gourd; it was a fine party, with many people who came from Kahaluu, and Mokapu, and it was very pleasant in the shade of the kukui, with enough food for all that came; the great spread of produce well-cared for by the farmers of this tiny Island was astonishing, and it would be a good thing if all our own lands were taken care of in the same way, then we’d in time be feasting off of the fruits. With mahalo, your friend. [For more on Moku o Lo’e, see the recent publication: Moku o Lo’e: A History of Coconut Island. Ka Hoku Loa, Buke I, Helu 3, Aoao 9. Sepatemaba, 1859.